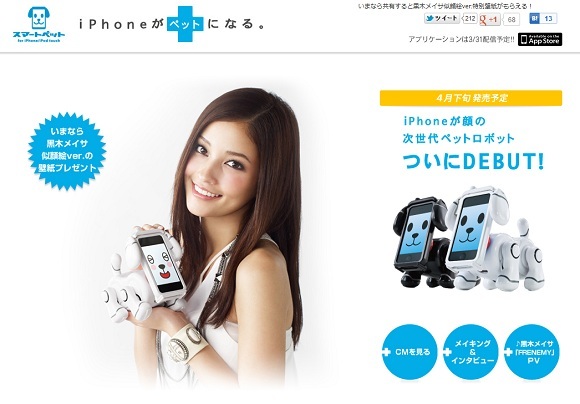 The Bandai SMARTPET Robot Dog for iPhone and iPod Touch is a smartphone dock taken to the next level. It's also the coolest virtual pet to come along since the legendary Tamagotchi. A lot has changed since then, of course, both with smartphones and virtual pets. In the case of Bandai SmartPets, those two combine when you slip your iOS device into the docking port situated on your SmartPet's face. Switch it on, fire up the SmartPet app, and your personal virtual pet is ready to show you some tricks! Much like a real animal's brain, your phone controls the SmartPet's body and the touchscreen responds to input. What's more, your SmartPet will listen to you by utilizing its voice and gesture recognition capabilities. When it puts its “mind” to it, your SmartPet will walk forwards or backwards, spin in a circle, sit on its haunches and wobble its neck, sing, dance, sneeze, and act dizzy. It'll learn to do tricks, following your training using your voice and hand motions. They can also interact with other SmartPets through integrated Bluetooth technology. Check out this video of Bandai's SmartPet going through its paces. Personalizing your SmartPet is as easy as pie. Change its face to one you like better or install pictures of your friend, significant other, spouse or boss. Saved a pic of your dearly departed pet? Revive him or her through the “magic” of modern technology... unless you think that's more than a little creepy.